We’ll start with a recipe associated with Chairman Mao Zedong. Hong shao rou--red braised fatty pork--is reputed to have been among his favorite dishes, one he ordered before major combat, asserting that that he’d never lost a battle when fed on hong shao rou. 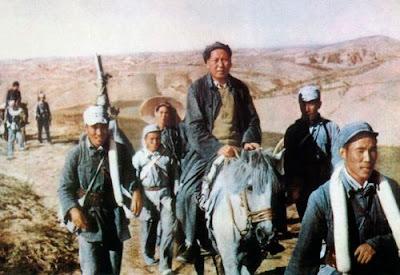 It is also regarded in Hunan Province, where Mao grew up, as brain food. Hunanese cooks traditionally leave the skin intact for maximum succulence (read: fat), and cut the meat into rather large chunks, perhaps 1 1/2 inches long. This recipe takes its color from caramelized sugar, which gives it a lovely reddish gloss, but many people just use dark soy sauce at home. 1. Plunge the pork belly into a pan of boiling water and simmer for 3-4 minutes until partially cooked. Remove and, when cool enough to handle, cut into bite-sized chunks. 3. Add enough water to just cover the pork, along with the ginger, star anise, chiles, and cinnamon. Bring to the boil, then turn down the heat and simmer for 40-50 minutes. 4. Toward the end of the cooking time, turn up the heat to reduce the sauce, stir in the chestnuts and season with soy sauce, salt, and a little sugar to taste. Add the scallion greens just before serving. Note: It is purported that vegetarian variations of this recipe can be made using garlic gloves, deep-fried bean curd, preserved mustard greens and water chestnuts as main ingredients. I wouldn't know. 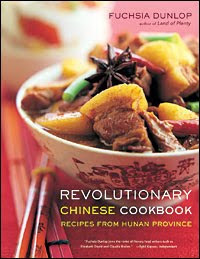 This recipe is adapted from the one in Fuschia Dunlop’s Revolutionary Chinese Cookbook—-she features a picture of a bowl of hong shao rou on the cover. I made this last night and it was fantastic! The recipe could use some clarifications. Chestnuts are mentioned in the ingredients and then forgotten in the method. Are the flavourings added whole or ground? I had them whole and it was fine, it'd be too much chilli if they were ground up. Otherwise, an awesome dish! I served mine with some steamed rice and some quickly stir fried veggies in oyster sauce. Perfect. So now FotM has moved on to a recipe page? And this one has too much sugar and not enough chillies, according to reliable revolutionary chefs! Revolutionary wishes for the Great October Revolution day.